Known for passionate affairs of the heart, the legendary Standard Oil heiress Millicent Rogers—subject of Cherie Burns's new biography, "Searching for Beauty" (St. Martin's Press)—advertised that her propensity for romance on her sleeve. 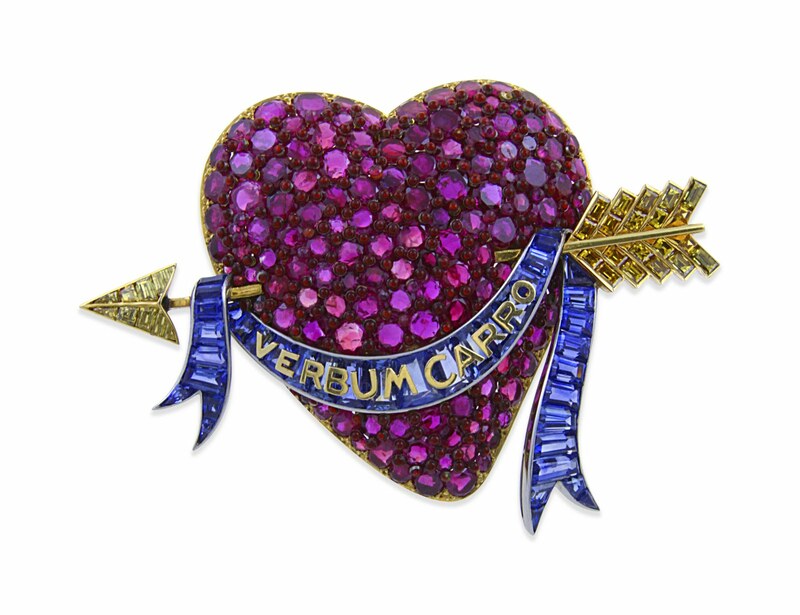 Or, rather, her bodice, in the form of a heart-shaped brooch made of pavé rubies pierced by an arrow composed of caliber-cut yellow diamonds. It is being offered for sale at Siegelson, the Manhattan jewelers. The price? A company representative coyly says the interested buyer should expect to spend in "the upper half of the six digits." So if you are seriously interested in acquiring this 3-3/8 inch by 2-3/8 inch ornament, click here to email your query. 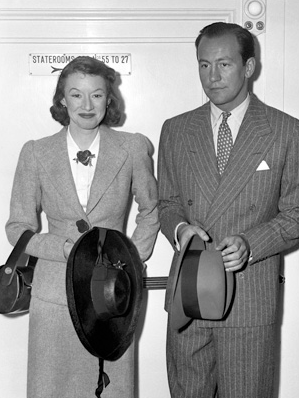 Millicent Rogers, wearing the Flato brooch, with her third husband, stockbroker Ronald Balcom, in 1939. Made around 1938 from a design dreamed up by Rogers for her friend society jeweler Paul Flato—its rounded, voluptuous shape is sometimes called a fat or puffy heart—the brooch is draped with a sapphire ribbon bearing the yellow-gold Latin phrase Verbum Carro. This has been translated as "A word to my dear one," thought it could be a play on Verbum caro, "The word made flesh," a reference to Jesus Christ as recounted in John 1:14. This makes some sense, since scholars have observed that the colorful jewel recalls the South American folk charms known as milagros.